I was contacted this week by a gentleman who wanted to talk about drains. It was never my ambition to become Newcastle’s Drain Man, but so be it. The man was a hydrologist and was preparing a brief in response to the Australian Institute of Engineers’ proposed revision to its guidelines on drains and waterways. Having investigated the Wollongong floods he was now looking at Newcastle, started his research in the City library, and was directed to “that man who walks around in the drains a lot”. We had wide-ranging chat about things drainy, and one of the topics we covered was how high it got during the Pasha Bulker flood. He’d heard reports that the water was close to the underside of the Chatham Road bridge, which I pooh-poohed. No way did it get that high. After he’d hung up I started wondering: had I been to quick to dismiss this claim? 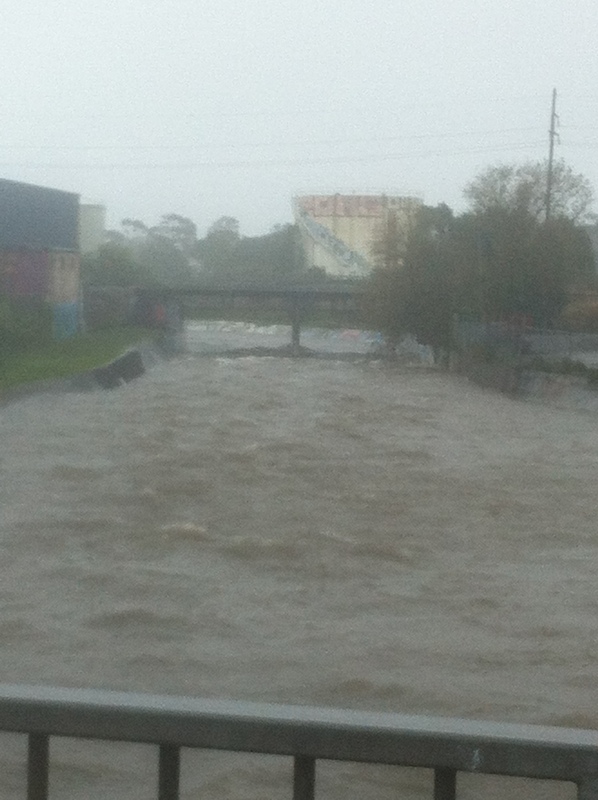 Fortunately, by coincidence a Drain Correspondent got in touch with pictures of the creek during the super storm. The following pics are all courtesy Isaac: cheers, mate. 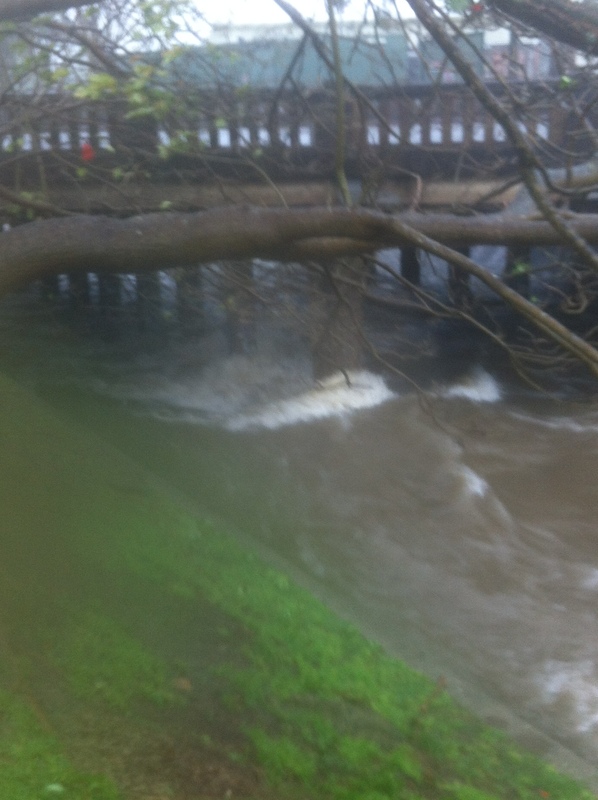 This one shows just how close to the top of the concrete banking the water came. But, hats off to those olden times engineers, they got the capacity pretty well right. I’ve never seen it spill over here, or anywhere apart from the section near Hamilton North Public School and the showgrounds. This photo, taken nail-bitingly close to the edge of the bank, shows that at Chatham Road bridge the water is nowhere near the underside, which is exactly as I remember it from the Pasha flood. I really do have to hand it to those Victorians, and the Edwardians who followed them. They sure knew how to build their urban infrastructure, whether it was sewers, drains or dams. The only time they got it “wrong” was the capacity of roads and bridges. They could never have predicted how much we would take to the motorised carriage; in fact, they’re still getting it wrong in Sydney now. Like drains, roads tend to spill out once they’ve reached capacity. But while we’re prepared to neglect our waterways we’re quite happy to lease our ports or electricity infrastructure in order to spend money on our roads. What a selfish species we are. So you had a “weather event” while I was away. It was big enough to make it onto the BBC news, which is massive for something about Australia that doesn’t involve a person being eaten by native fauna, or a person (such as a cricket captain or prime minister) having a cry in public. Over there it was reported as having happened in Sydney, because to British ears Sydney is Australia. It was also reported as being “like a cyclone” or “the equivalent to a category 2 cyclone”. Poms have no idea what the categories of cyclone are, and so “2” could be quite mild or could be apocalyptic; we took it from the vision of trees torn down and cars bobbing along the street that “2” was pretty bad. We could only imagine what “1”or “3” must be like. However, by the time I got back to Oz the event was being called a “super storm”. Is that a thing? If so, does it have a category? Or is it a name invented by the insurance industry to stymie claims, in the same way that after the Pasher Bulka storm people discovered that they were insured for inundation but not flooding? 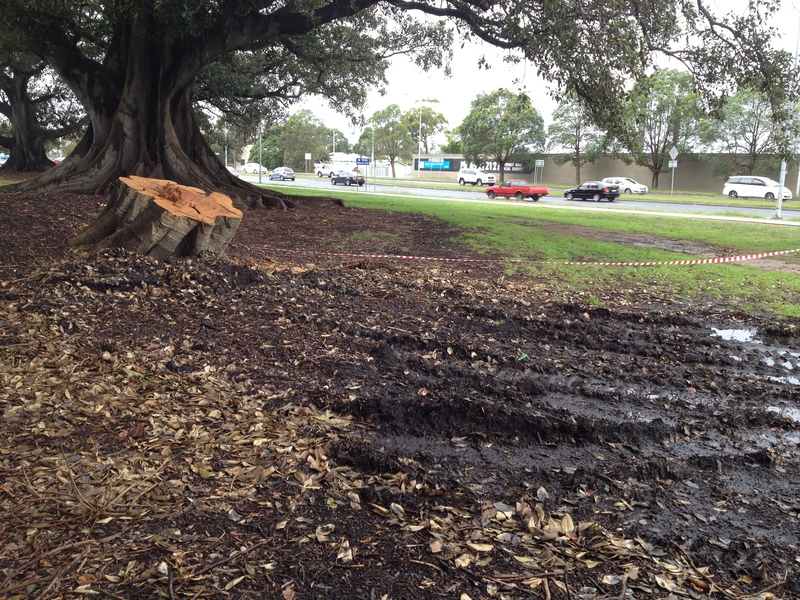 Newcastle has become dotted by stumps: in people’s yards, by the roadside, in the parks. 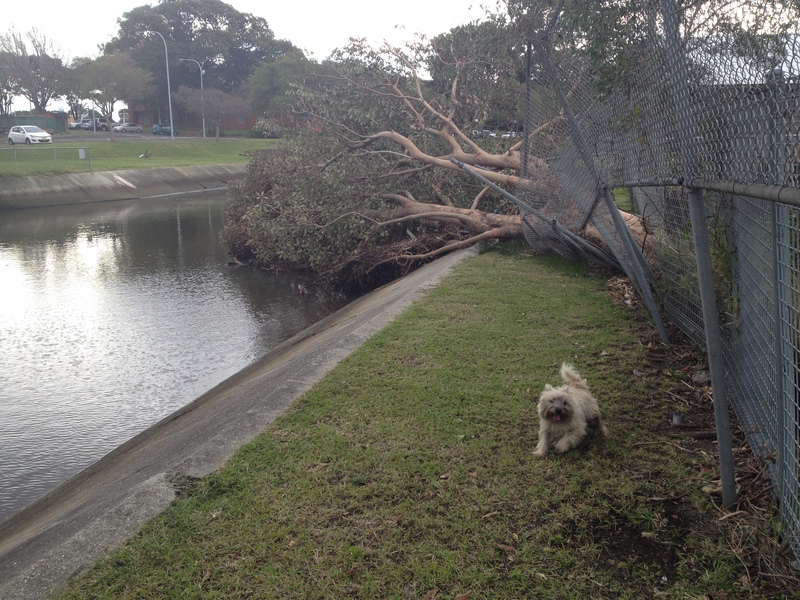 One of the big figs in Richardson Park took a dive. It was late evening on Monday before I got into the creek. 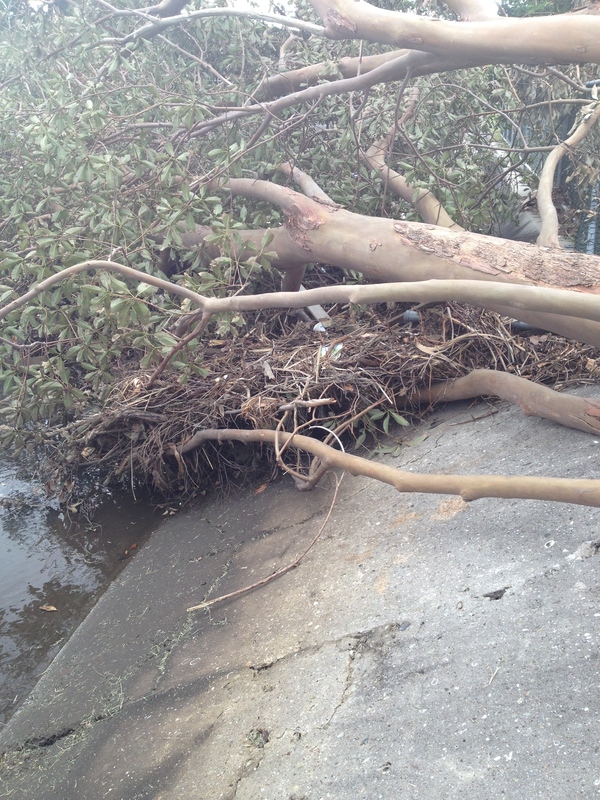 I walked down as far as the litter boom by the TAFE and was startled to see a tree across the banking, from Islington Public School. 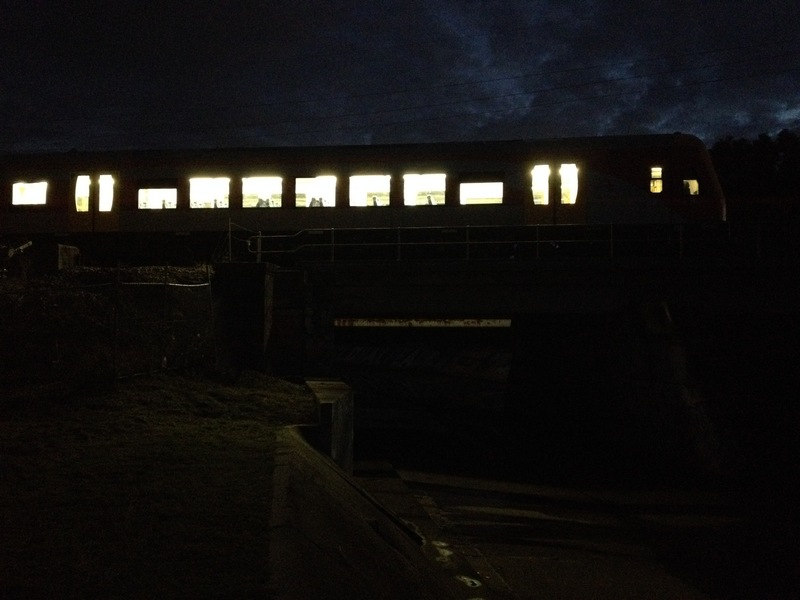 It was too dark to take a picture, unfortunately, but on the way back I captured a Maitland train as it paused and chuffed and chuntered on the Styx bridge. This morning I went back down there. It is a very big tree indeed and must have made a hell of a bang when it came down, though given the reports of the howling wind and of things being thrown around the place I doubt whether anyone heard. Which puts paid to one philosophical riddle. The wrack in the branches shows how high the creek got to after the tree fell. It must have been impressive and I almost wish I’d been there to see it. Actually, on second thoughts I’m glad I didn’t. Unlike yesterday evening it was lovely and light this morning, and so as I emerged from beneath the rail bridge I saw a new roll-up that must have happened in recent weeks. After all the carnage of the event, or cyclone, or super storm, or whatever it was, this was a rather comforting message. Everything will be all right. 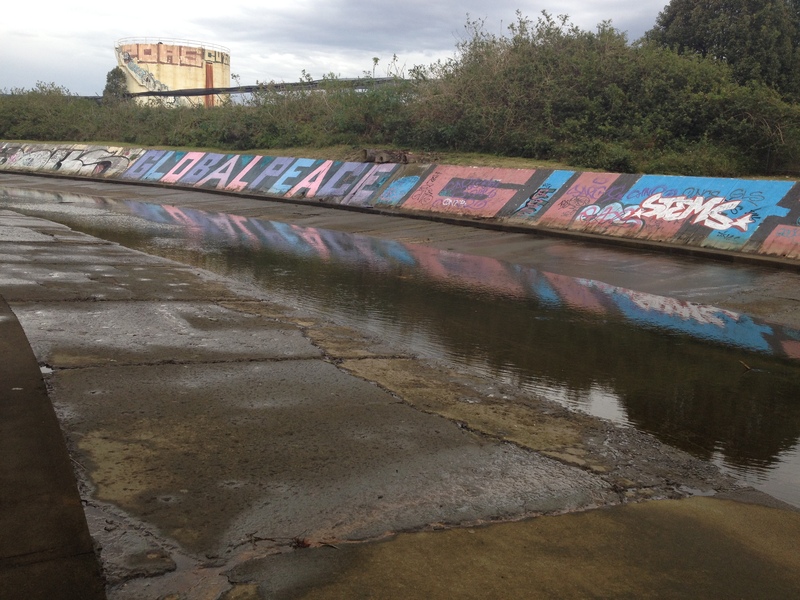 In Australia, a creek can be a tiny meandering trickle or a gigantic floodout. Just ask Burke and Wills. 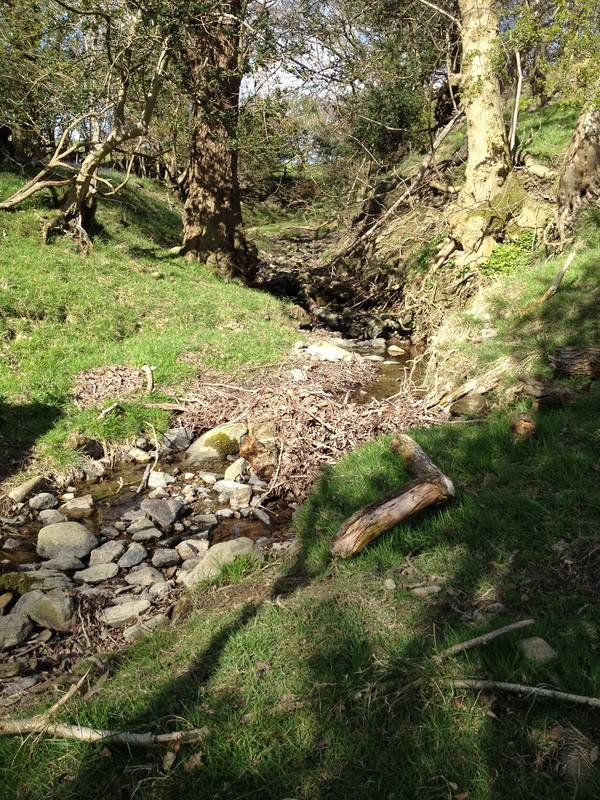 But in Cumbria a beck is a beck is a beck. 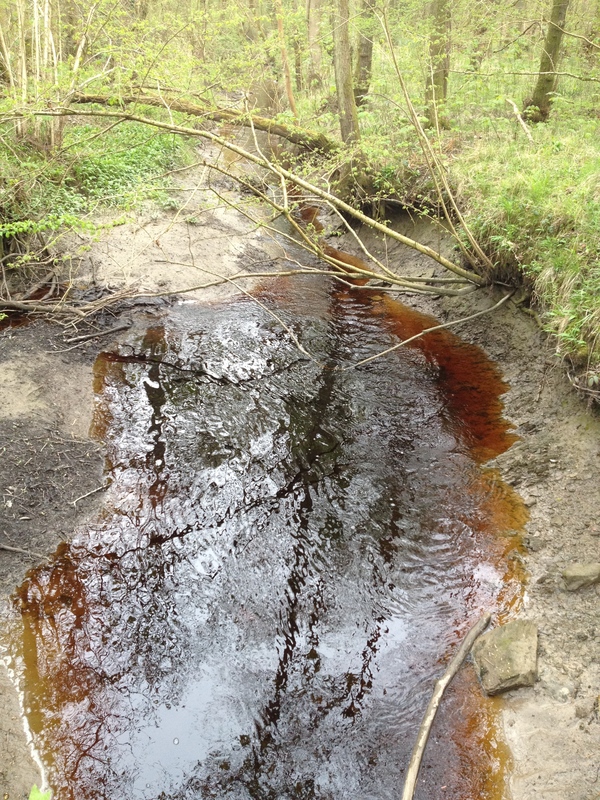 I call the narrow sluice of permanently flowing water that runs down the centre of Styx Creek “the beck”. I call it that because it’s the right size: it’s “beck” sized. But there the resemblance ends because the beck in Styx Creek has been corralled and straightened into nothing more than a water sightline. 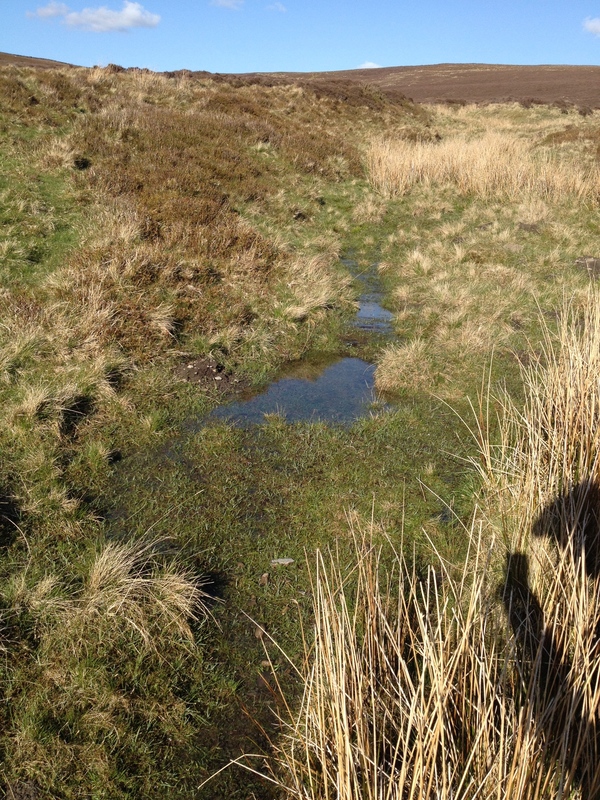 Here’s what a beck should look like, up on Kirkby tops. Sure, this is pretty small, even for a beck. That’s because it’s up on the fells and not far from the spring where it starts. But it’s still a beck. As I took this photo a woodpecker drilled a tattoo in the top of an old oak tree and lambs bleated in the croft next door. It was just as I remembered it. 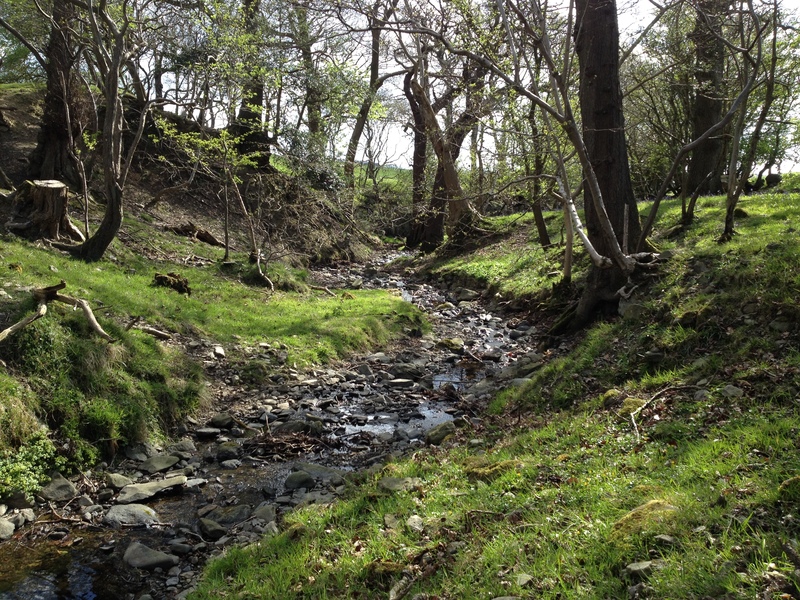 This beck’s around the same elevation and so it’s similar in its topography. It has lots of rounded cobbles, which are great for making dams with, and trees big enough to have rope swings where the beck makes pools. This last beck’s the least representative of the group but it’s still a beck. This one’s at a place called Roundsey (pronounced Runzy) Woods, near the estuary where the peat moss dirties the water. It’s on the side of the estuary where slave ships docked and disgorged their cargo, washed them and marched them over the tops to Whitehaven for export to the Americas. But that was the 1770s and, like the 1970s, things were different back then. I’m emerging from a foggy period that began just before Easter and ended on the first day of May. Being around these becks and on these fells has been a great solace, but soon I’ll be back in Styx Creek with Jambo. I’ll look at that concrete sluice running like a gunshot from New Lambton to Islington and tell myself that it’s a beck, but I don’t really think so. It’s not really a creek either. I’ll have to find a new word. Any ideas? You are currently browsing the Hamilton North, NSW 2292 blog archives for May, 2015.